accessible by car. This resort is recommended to couples but also to families, with spacious and well-furnished rooms. 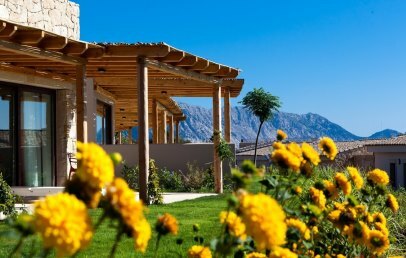 The Paradise Resort & Spa is deeply immersed in the green of the Punta di l’Aldia headland, San Teodoro, located along the northeast coast of Sardinia. This part of the Maquis shrubland belongs to the marine protected area of Tavolara, thus guaranteeing an unrefined environment for nature-lovers who, at the same time, might not wish to restrain themselves from the buzzing tourist life of the close-by San Teodoro. The Paradise Resort & Spa disposes of its own private garden with a swimming pool as well as a place for sunbathing. Moreover, the Lu Impostu beach with white sand surrounded by clear waters can easily be reached by a short walk. The Olbia airport is approximately 22 km away from the hotel. The Paradise Resort & Spa is a 5-star Resort. It is elegant and exquisite Resort and offers a nice outdoor pool with a wide sunbathing area. It offers its guests various facilities and services to make the stay as comfortable and enjoyable as possible. The Resort is also suitable for the youngest guests. The 111 generously-sized rooms are bright spaces, furnished in a minimal style. All rooms have a balcony or a terrace, which either overlook the garden or the sea. The Wi-Fi connection is complimentary. Daily pool and beach towels. All rooms are NON smoking. The Classic, Superior and Deluxe rooms are comfortable and have a terrace with garden view. Junior Suite are open-space with 34-36 sq.m. surface with a double bedroom, a living area with a sofa bed, a bathroom and a balcony or a terrace (17-20 sq.m.). 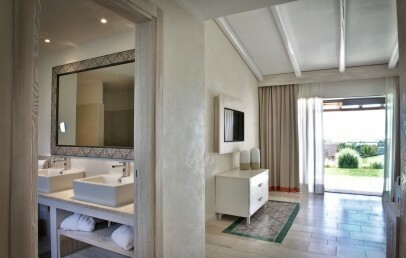 Suite can also be independent suites, with approx. 45 sq.m. surface, with a double bedroom, a living room, a bathroom and a patio or balcony with approx. 25 sq.m. surface. The closest beach to the Resort is Lu Impostu, with white sand and shallow sea entrance, which can be reached by foot through a path surrounded by the nice Mediterranean vegetation and a floating dock (approx. 5 mins. walk from the pool / 350 m). Around San Teodoro are various other nice beaches, long sandy beaches, crystal clear blue water and several tourist facilities. The beach service is included in the price from June to September at the beach club, starting from the 3rd row, including 1 umbrella and 2 loungers per room (upon availability). Plus Beach Service – prices for the 1st or 2nd row with 1 umbrella and 2 loungers reserved throughout the entire stay for May, June, September, October: 1st row € 50.00 per day, per room; 2nd row € 30.00 per day, per room. Prices for July and August: 1st row € 60,00 per day, per room; 2nd row € 40,00 per day, per room. The Spa of the Resort offers a Finnish sauna, Turkish bath, emotional showers, ice fountain, relaxation area with a tea corner, three treatment rooms, a private spa and fitness room (use complimentary) with Technogym equipment. Various treatments for the different needs are offered and the product line that is used, is natural biological. There are several possibilities to play sports at the Paradise Resort: for golf lovers there are the nearby located Puntalia Golf Club and the Pevero Golf Club. Moreover, you can undertake excursions by horse, rent mountain bikes, go for a hike and a jog, or make use of the hotel’s soccer pitch, tennis court and volleyball field. The beach possess a beach volleyball field, all necessary equipment for any kind of water sports and even the possibility for ultralight aviation. With wide equipped areas and special services for children, Paradise Resort is the ideal destination for a family holiday. Little guests can enjoy the large outdoor spaces of the resort, the special swimming pools and the nearby beach, with its shallow sandy sea bed. Experienced operators will take care of children aged 4 to 12 years (mid-May to mid-September). The mini club offers interesting educational and recreational activities: dancing, group games, craft activities and nature experiences. With the mini club the younger guests have the opportunity to have lunch or dinner in a reserved area in the restaurant at earlier eating times. The restaurant Verandah is the main restaurant of Paradise Resort & Spa. It offers a welcoming, elegant atmosphere with a panoramic view and typical Mediterranean cuisine with island specialties. The breakfast is buffet style and lunch and dinner are served at the table. For guests with half-board (breakfast + dinner, not interchangeable with lunch) and full board (breakfast + lunch + dinner), a menu is available with a choice of starters, 1st and 2nd course. The desserts and salads are mostly served at the buffet. Sometimes, at a discretion, the chef organizes theme evenings that require a different kind of service. For guests booked in B&B, the restaurant has an à la carte menu. During high season the Gourmet Restaurant is open for dinner à la carte (extra charge). For lunch guest can enjoy an à la carte light lunch at the Sunrise Bar. The Resort is surrounded by a nice garden, where you can stroll through the fragrant trails in search of a peaceful corner, immersed in nature or indulge yourself in a swim at the pool and taking a sun bath. The parking area in front of the hotel is free of charge. Small pets allowed only in the Villa Suite garden view (on request). The double bed room is modern and bright. The bathroom has a shower. The veranda is equipped with table and chairs and offers garden view. The Superior room can accommodate a family with children up to 2 years in a baby bed and have double entrance, from the door and from the veranda. 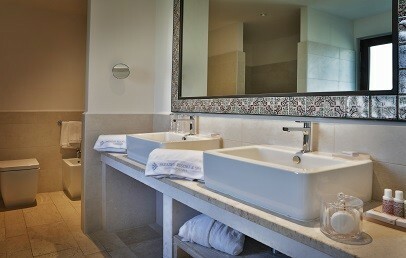 Modern and spacious Junior Suite with a double bed and a sitting area with a sofa bed, for an additional guest. The bathroom has a shower. All Junior Suites have a terrace with garden view and are equipped with a table, two chairs and two sun loungers. These Suites are located on a privileged position. They are modern and distinguishably furnished. They offer a spacious double bedroom with a walk-in closet and a separate living room with a sofa bed that can host additional 2 guests. The bathroom has two washbasins, a shower and a tub. The Suite have a veranda with garden view. Both are equipped with sun loungers, a table and chairs. The double bedroom is modern and bright. The bathroom has a shower. From the equipped veranda with table and chairs is the access to the room and it offers garden view. The spacious double bed room can, if required, accommodate a third bed for a child from 3 to 15 years. The furniture is modern and the room is bright. The private bathrooms have a shower. The Deluxe rooms have a terrace with garden view.